Orson Young raises to 55,000 and everyone folds. Dennis Phillips raises to 55,000 and all fold. Dennis Phillips raises to 55,000 on the button. Anton Smirnov three-bets to 124,000 and Phillips calls. The flop is and Smirnov bets 90,000. Phillips moves all-in and Smirnov passes. Daniel Strelitz pushes all in from under the gun for 195,000. Orson Young then reshoves all in from the button. Dennis Phillips in the small blind goes into the tank, shaking his head, before announcing all-in. Ben Zamani gets out of the way. 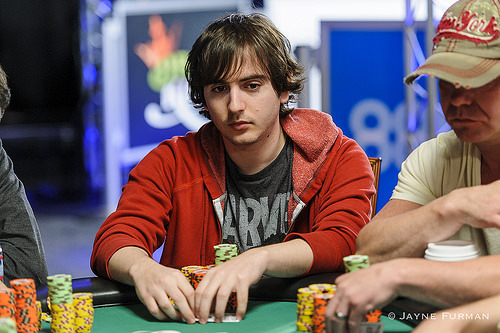 The board runs out , meaning that Young & Phillips split Strelitz's stack as he heads for the rail in 8th place. Barry Hutter raises to 55,000 from the button and Dennis Phillips calls from the big blind. The flop is and Phillips checks. Hutter also checks and the turn is the . Phillips leads for 65,000 and Hutter calls. The river is the and Phillips bets 75,000. Hutter gives it up after a short dwell. Dennis Phillips raises to 55,000 under the gun and all fold. Daniel Strelitz raises to 50,000 and Kitty Kuo calls. Barry Hutter in the big blind also calls and the three see the flop of . Hutter checks, Strelitz also checks and Kuo checks. The turn is the and it is checked around. The river is the and Hutter reaches for chips, betting 110,000. Strelitz calls and Kuo folds. Hutter shows for two pair to claim the pot. Orson Young raises to 55,000 and Dennis Phillips calls. Everyone else folds and the dealer fans out a flop of . Young leads for 65,000 and Phillips folds. Daniel Strelitz raises to 50,000 and takes the pot. Elizabeth Montizanti raises to 55,000 and Orson Young three-bets to 125,000. Montizanti calls and the flop is . Montizanti leads for 100,000 and Young calls. The turn is the and Montizanti fires out a bet of 245,000. Young gives it up and Montizanti stacks the chips. Elizabeth Montizanti raises to 55,000 and everyone folds. When play restarts after the second break there will be eight players. Randy Pfeifer and Grayson Ramage were eliminated in 10th and 9th place. The players are on a 20 minute break after they move their chips to the second feature table to finish out the shootout. Dennis Phillips limps in the small blind and Benjamin Zamani checks. The flop is and Phillips checks. Zamani bets 36,000 and Phillips calls. The turn is the and Phillips checks. Zamani bets 76,000 and Phillips calls. Elizabeth Montizanti raises to 45,000 and Barry Hutter three-bets to 110,000, and takes down the pot. Daniel Strelitz raises to 40,000 and Kitty Kuo and Anton Smirnov call. The flop is and Strelitz bets 70,000. Smirnov calls and Kuo raises to 165,000. Strelitz and Smirnov both give it up. Anton Smirnov raises to 40,000 and Kitty Kuo calls. Elizabeth Montizanti three-bets to 140,000 and Smirnov folds. Kuo calls and the two ladies see a flop of . Montizanti bets 150,000 and Kuo goes deep into the tank before folding. Barry Hutter raises to 45,000 and Benjamin Zamani three-bets to 95,000. Hutter four-bets to 235,000 and Zamani calls. The flop is and both check. The turn is the and Hutter checks. Zamani checks behind and the river is the . Hutter taps the table and Zamani checks behind. Hutter tables and Zamani mucks his hand. Barry Hutter raises to 45,000 and Orson Young three-bets to 105,000. It folds back to Hutter who four-bets to 240,000. Young gives it up.